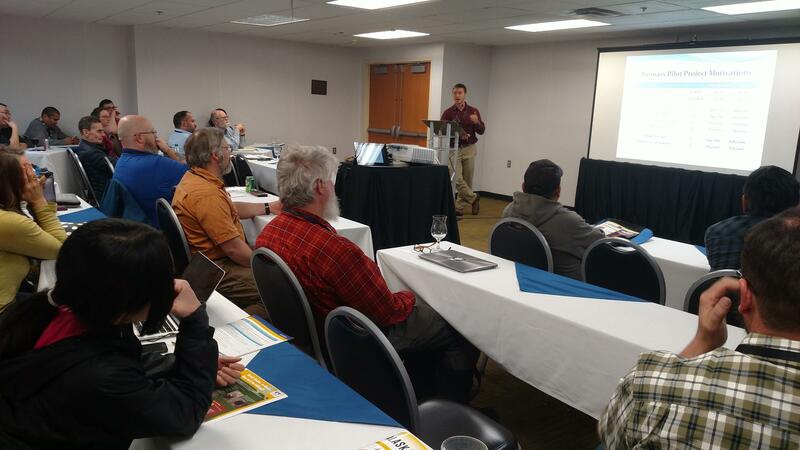 About 400 people from around Alaska and elsewhere converged on the Westmark Fairbanks Hotel and Conference Center this week to talk about how residents of the state’s rural and remote communities can reduce high energy costs during the 20th Rural Energy Conference. Organizers say turnout for this year’s conference is good and interest is keen in finding solutions to the growing problem of sky-high energy costs in Alaskan communities located far off the grid. Holdmann is the director of the Alaska Center for Energy and Power at UAF, which helps the Alaska Energy Authority organize the biennial conference. “What this conference is really about is it’s about bringing people together to share experiences, share stories on what works, what doesn’t work, what direction they’re going,” Gwen Holdmann said. Holdmann has attended all 20 of the events, and she says they’ve evolved in recent years as technological solutions to the problem of high-energy costs have emerged. Holdmann says earlier conferences focused on improving existing power-generating systems. She says that changed a few years ago when the price of diesel and fuel oil rose sharply, and utilities – especially those that serve smaller communities – started looking for alternatives. “After we saw the fuel spikes in 2008, there was a huge increase in activity,” Holdmann said. Holdmann says that’s why conferees are talking a lot more now about employing technologies that improve efficiencies. And about renewable-energy sources such as woody biomass, wind and solar to reduce the use of diesel to generate power. And she says industry is taking notice. Renewable-energy expert Chris Rose agrees Alaska has become a leader in improving the microgrids that distribute power to small isolated communities. But he says Alaska is still catching up on using alternative energy to generate heat and power. Rose is executive director of the Renewable Energy Alaska Project. He says the state has more than 70 alternative-energy technology projects. And he says the growing use of those technologies is reflected in the presentations being given at the conference – and the conversations going on in the hallways. Both Rose and Holdmann agree that Alaskans will have to leverage the state’s growing reputation as a proving ground for microgrids and renewable energy, because state and federal funding, like the Alaska Energy Authority’s Renewable Energy Fund, has dried up. So, Holdmann says Alaskans must look to the private sector. The Rural Energy Conference continues through noon Thursday at the Westmark.